Lest you think we eat only gourmet meals each and every night I thought I'd prove otherwise. Last night I reached into the mental recipe box of my college days and pulled out one of my old standards. 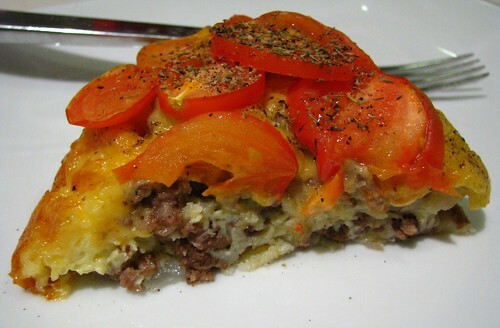 Bisquick's Impossibly Easy Cheeseburger Pie. It was the perfect meal in college: cheap, easy and it lasted for days. By college standards this was considered a fairly gourmet meal. Meaning, it involved baking. I have to say though, it's pretty darn good stuff. If you can manage to brown ground beef, chop an onion, and whirl a whisk, you can certainly handle preparing this dish. My own addition: fresh tomatoes on top (because Mom always taught me your food has to have color). Heat oven to 400°F. Spray 9-inch glass pie plate with cooking spray. In a large skillet, cook beef and onion over medium heat until beef is brown; drain. Stir in salt and pepper. Spread in pie plate, then sprinkle with cheese. In small bowl, whisk remaining ingredients until blended. Pour into pie plate. Top with tomatoes. Bake about 25 minutes or until knife inserted in center comes out clean. High Altitude (3500-6500 ft): Bake 30 to 35 minutes. This looks great! My husband would love this. He's like a giant kid. Meat, cheese and potatoes...that's all he will eat.